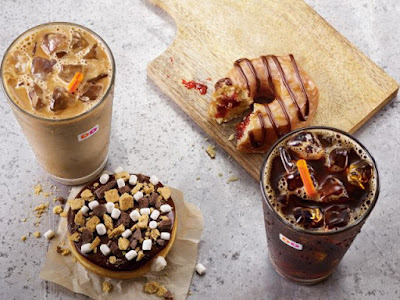 Dunkin' Donuts strikes a summer theme with the debut of two new seasonal donuts, the S'mores Donut and the Chocolate Drizzled Strawberry Croissant Donut. The S'mores Donut is a yeast shell donut with a toasted marshmallow-flavored filling finished with chocolate icing, graham crackers, milk chocolate chunks, and marshmallows. The Chocolate Drizzled Strawberry Croissant Donut features a croissant donut with strawberry filling and a chocolate icing drizzle. Both donuts can be found throughout the summer at participating locations nationwide. The donut chain has also expanded Dunkin' Energy Punch Powered by Monster Energy nationwide (except in select areas where they are offering Dunkin' Energy Punch Powered by NOS Energy Drink). The energy punch drink was previously only available at select locations in New England, Miami, and West Palm Peach. It features a combination of either (based on geography) a can of Monster Energy or NOS Energy Drink mixed with either Blue Raspberry or Strawberry fruit punch flavors over ice.